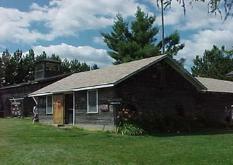 The Cabins at Matagamon Wilderness are located on a quiet road across the river from the Store. We just completed the bathroom on the Caddis Hatch! So now all our cabins have full baths! 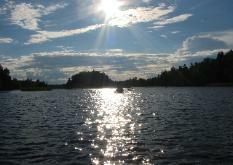 All of our cabins are great 4 season get aways! 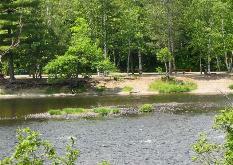 Matagamon Wilderness Campground is a nice quiet, family friendly campground. Of which all are welcome to come and enjoy! It is located on the East Branch of the Penobscot River and one and a half miles from the north entrance to Baxter State Park. It is a beautiful getaway with lots to see and do! 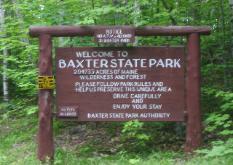 At Baxter State Park a visitor will still find a narrow, winding, unpaved road, only streams and ponds for water sources, trails and untamed terrian that continue to test hikers' stamina and nights lite only by the moon and stars. There are several short hikes or for the more extreme hiker there is the Traveler Loop on the North end of the Park and of course Mt Katahdin on the South end of the Park. Also just a couple of nice spots to check out on the North end is Trout Brook and South Branch! The East Branch of the Peneboscot River is located right out our front door. It has lots to offer!! Nothing beats on a hot Summer day then tubing down the river!! It is a great Native Brook Trout and Salmon fisheries. You can also rent one of our canoes or kayaks and grab a homemade italian from the store and take a paddle down the prestine waters of the East Branch where around each corner you may find a moose eating or a bald eagle swooping down to get his lunch. Or if you are up for a hike or mountain bike ride you you could take the IAT trail down to the Haskell Rock Falls and Grand Pitch! 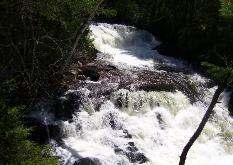 Matagamon has great Brook Trout and Salmon fishing! You can rent on of our boats, canoes, and kayaks at the store to explore some of the natural beaches, Webster outlet, sightseeing for some wildlife, or go fishing for some Native Brookies!! The Lumbermen's Museum is located in Patten, 26 miles from Matagamon. Did you know that the forests of Northern Maine once supplied some of the best ship masts in the world and that Bangor was once the largest shipping port for lumber in the world? You can check out all the old time logging traits there at the museum! They have a annual Bean Hole Bean Day celebration in conjunction with Patten Pioneer Days, its always held on the 2nd Saturday in August. Three major falls, total drop 18 yds. 8 ½ miles from Matagamon, 15 min. hike to the falls, this is a steep climb to the bottom. Great fishing and swimming area. A beautiful site to see. If you like to do some snowshoeing it is also very beautiful in the Winter! !